Ten years ago, it was unimaginable that Malaysia would create a policy to make it a regional centre of excellence for education. 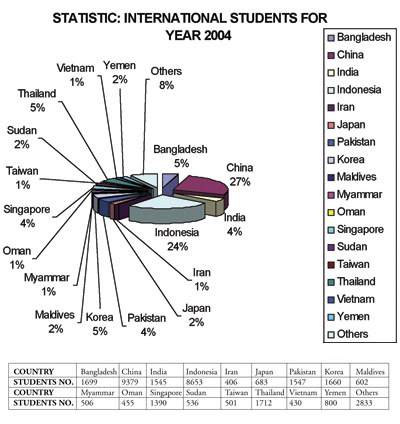 Since then, there has been a steady increase in the number of foreigners seeking higher education in Malaysia. Today there are over 40,000 students from all over the world. Malaysia. Fast becoming a desired hub for the pursuit of higher education. Established, reputable universities from around the globe are setting up campuses, working jointly with Malaysian universities and colleges to offer international diplomas and degrees in almost every discipline. We are already attracting a large number of students from all over the world. Studying in Malaysia is a unique combination of all things Asian with a touch of an international cross-cultural experience. A paradigm shift in learning. It’s happening in Malaysia.